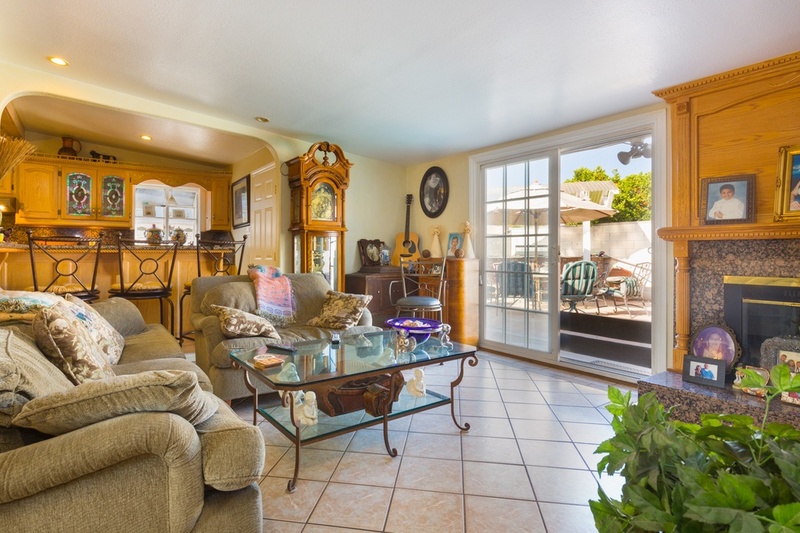 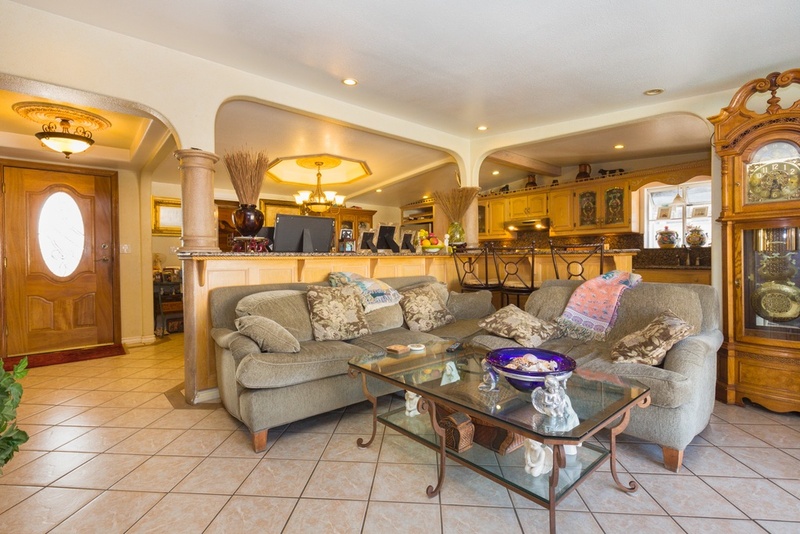 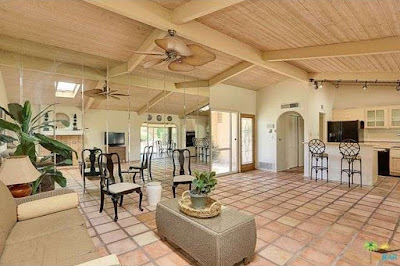 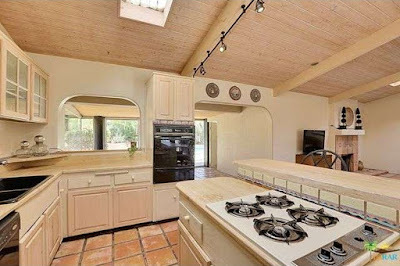 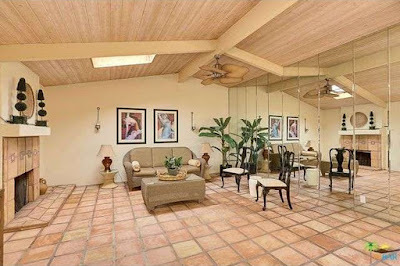 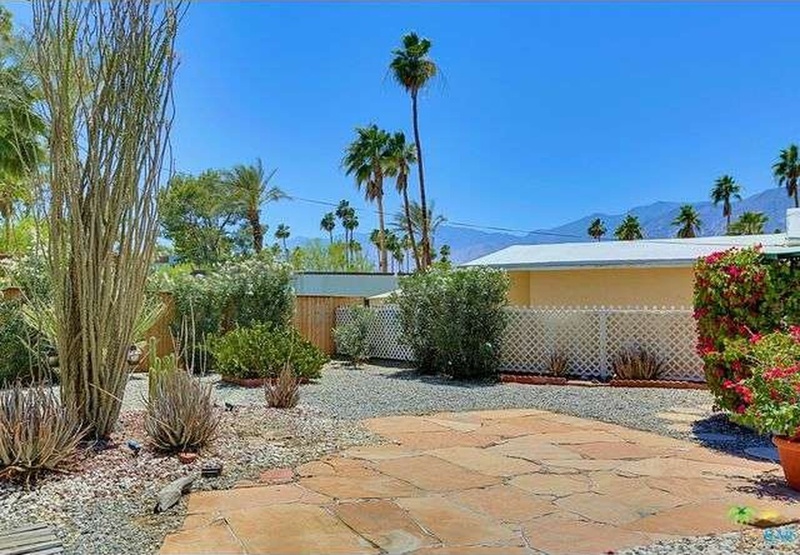 Relatively recent to the market is this Twin Palms Estates Palmer & Krisel vacation home opportunity. 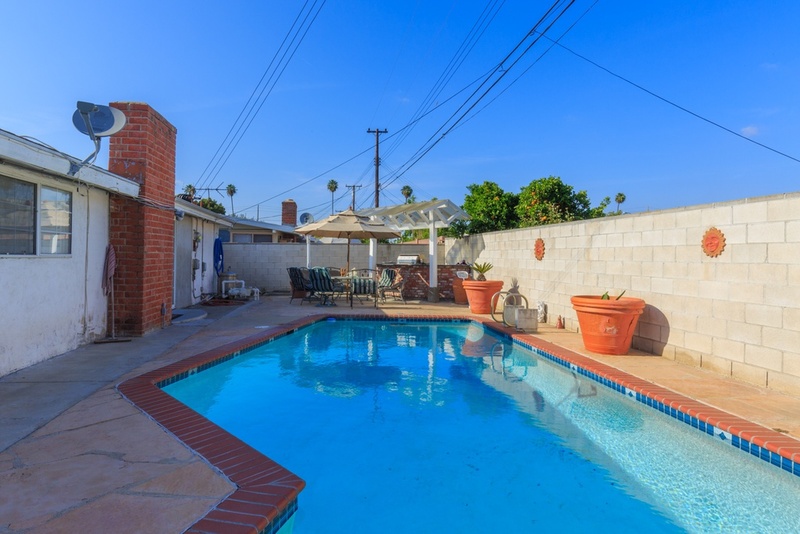 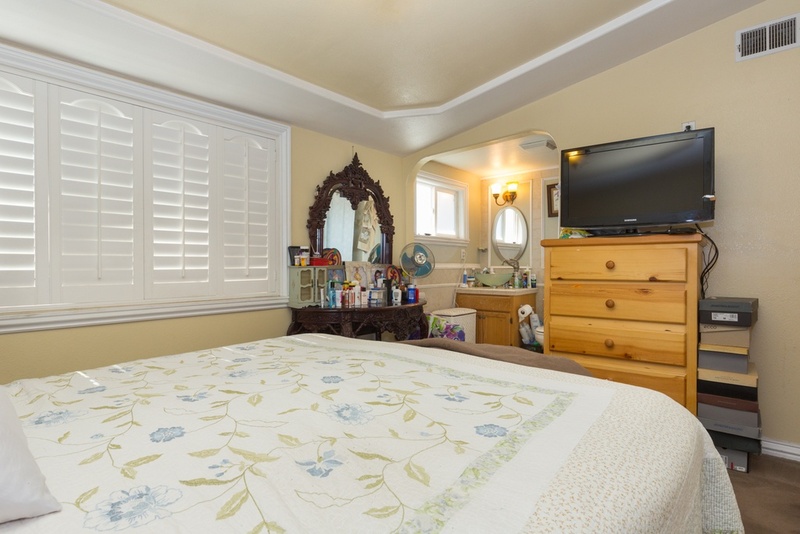 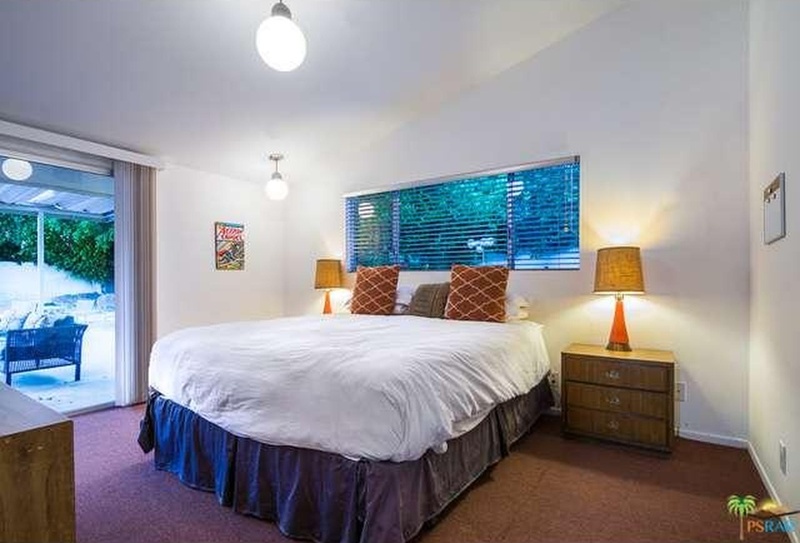 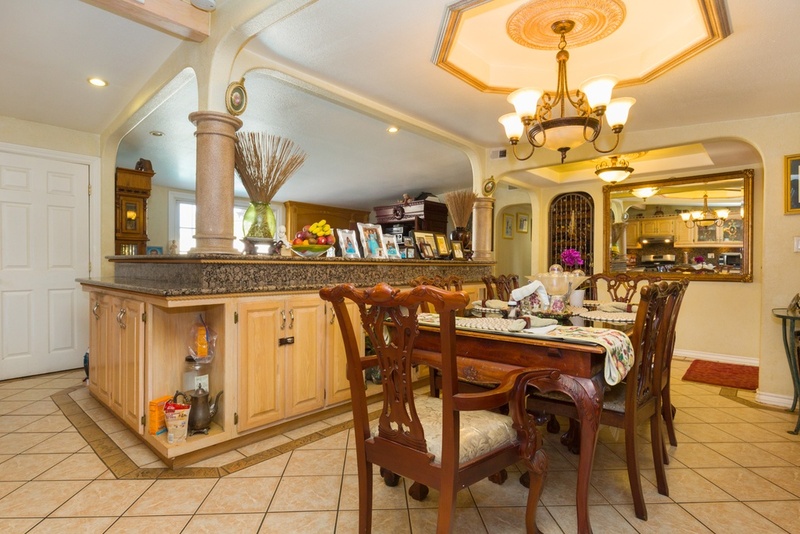 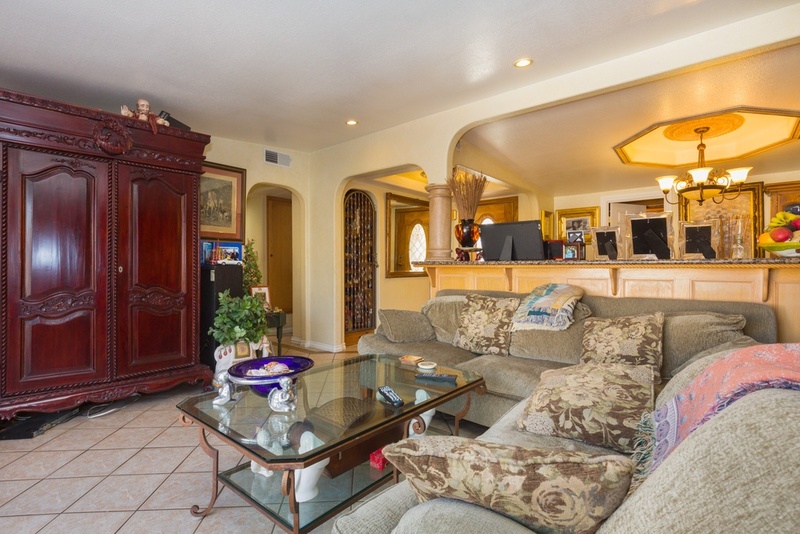 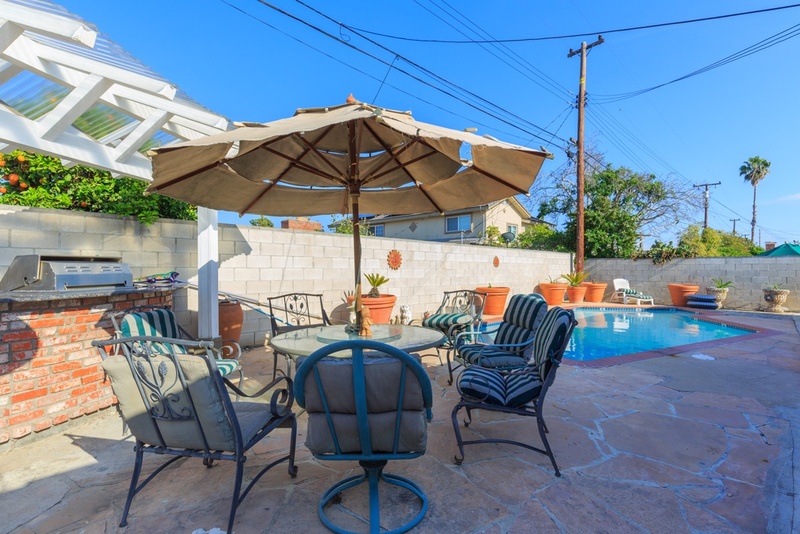 Expanded from a modest 1,600 square feet to its current 3,100 square feet, this home features five bedrooms and three bathrooms on a 10,800 square foot lot with an in-ground pool and carries an asking price of $769,000. Built by the Alexander Construction Company in 1958, this home has seen numerous additions and modifications over the years. 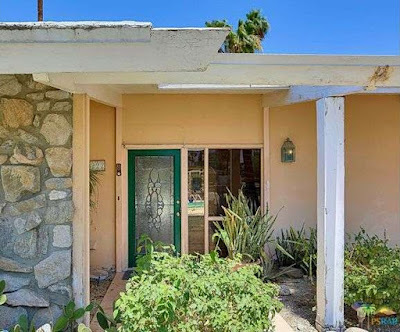 The front of the home has a fortress-like appearance, with two front additions flanking the front door and the two-car carport long converted to habitable living space. 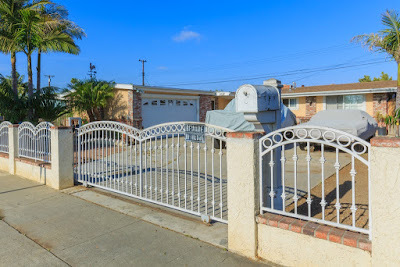 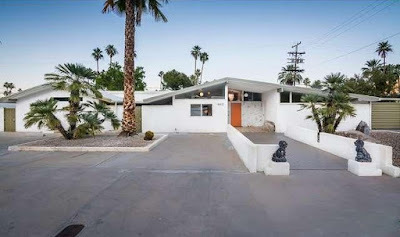 The front yard is nearly all driveway and concrete, with only two small planters containing palms and rock flanking a long concrete trench leading to the front door. Inside the home, the main living areas are oriented towards the north side of the lot while the three original and expanded bedrooms lie along the south side of the home. 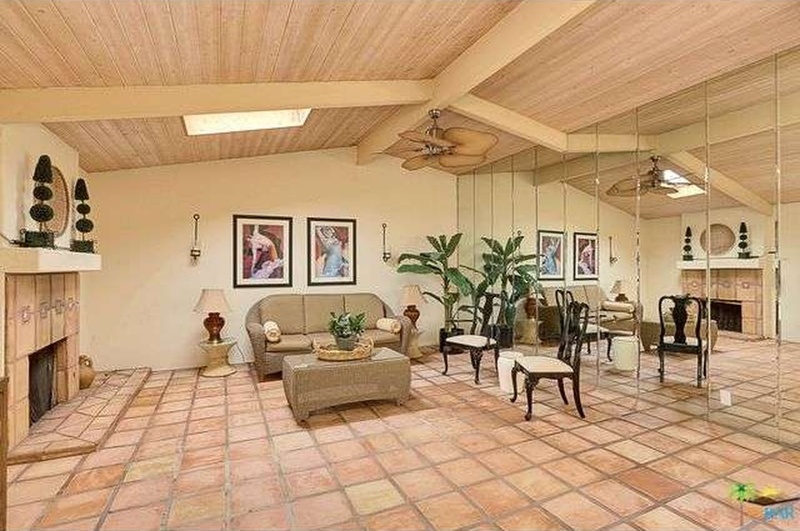 The carport has been converted to a large pool house with its own bathroom. 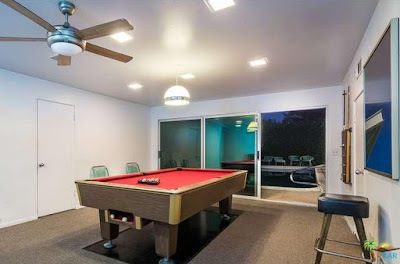 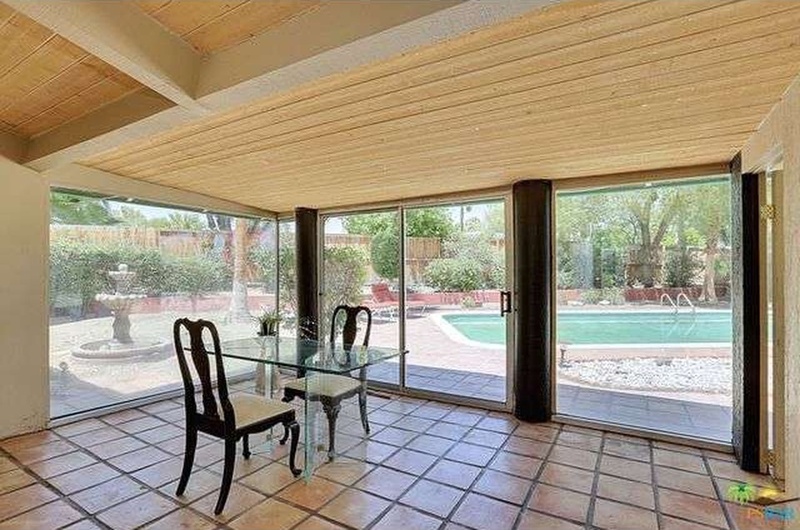 The north facing living room still generally maintains its original proportions and aesthetics, with large walls of sliding glass doors overlooking the north-facing pool and backyard. The original modernist fireplace has been flattened into a more generic form, and a swanky wet bar with smoked mirrors sits opposite the fireplace. 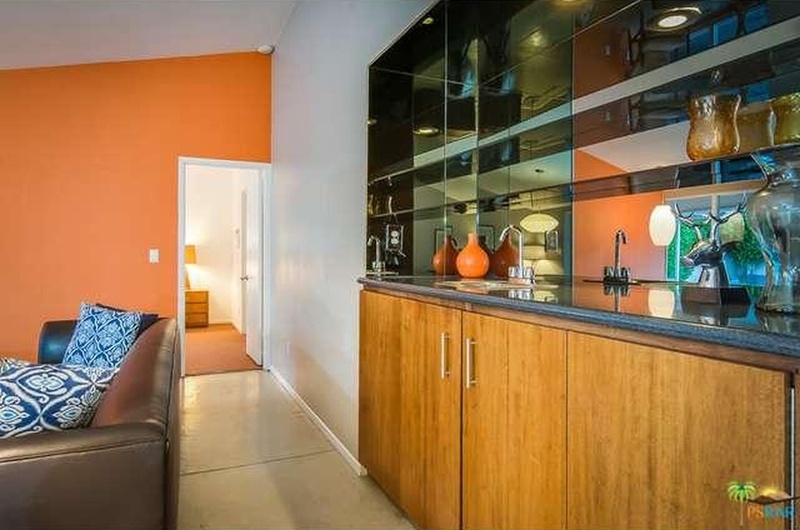 George Nelson bubble lamps help add a touch of modernism to the room, and a bright orange wall adds a fun pop of color. The kitchen sits at the front of the home, and features newer retro cabinetry and light blue counters. Simple white appliances keep in line with the clean lines of the kitchen, and a built in-coffee maker adds a modern touch. With all the additions on this home, there’s plenty of bedrooms to be had – five total, making this an ideal vacation pad. 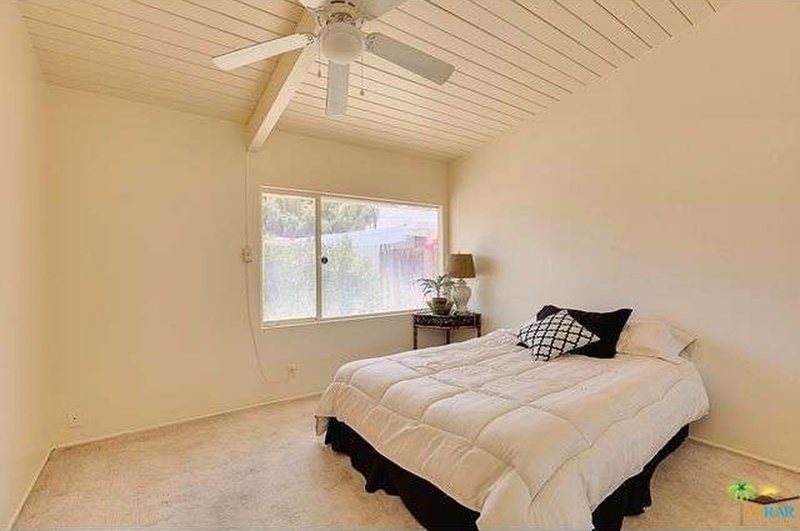 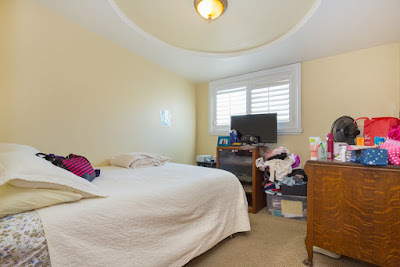 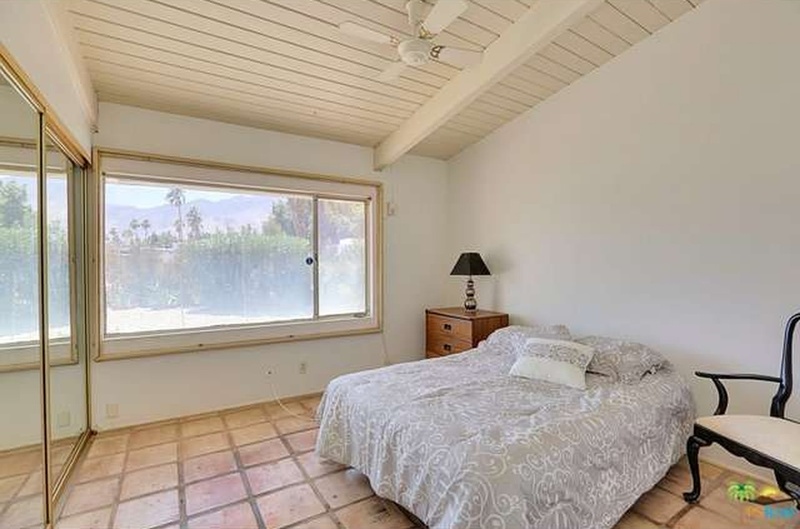 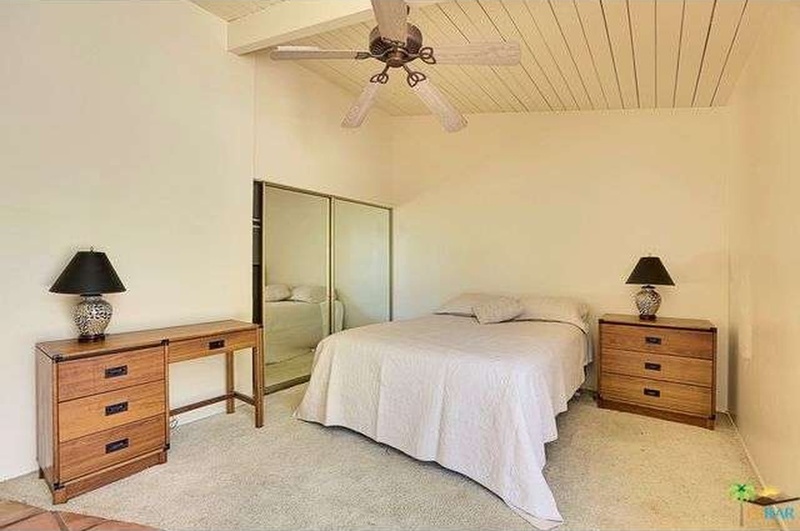 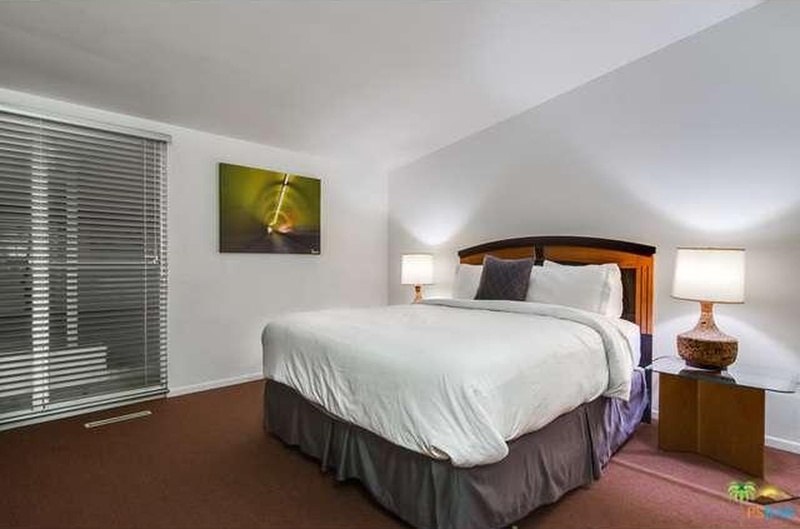 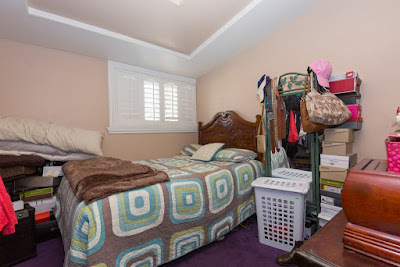 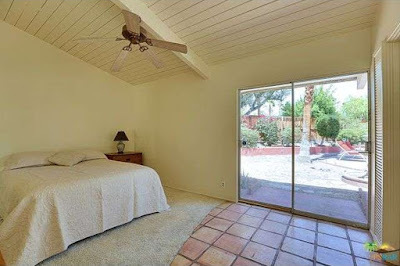 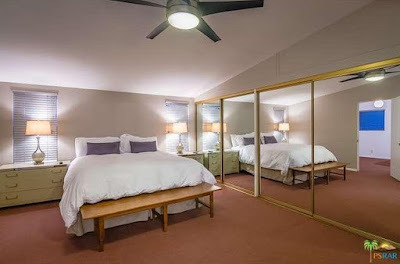 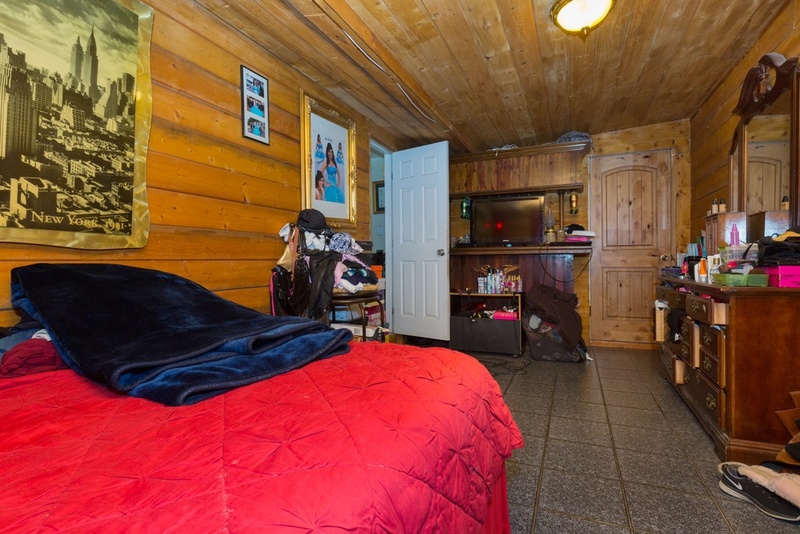 The bedrooms all feature vaulted ceilings, with all bedrooms clustered along the north and south sides of the home. 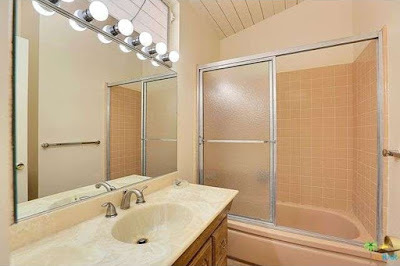 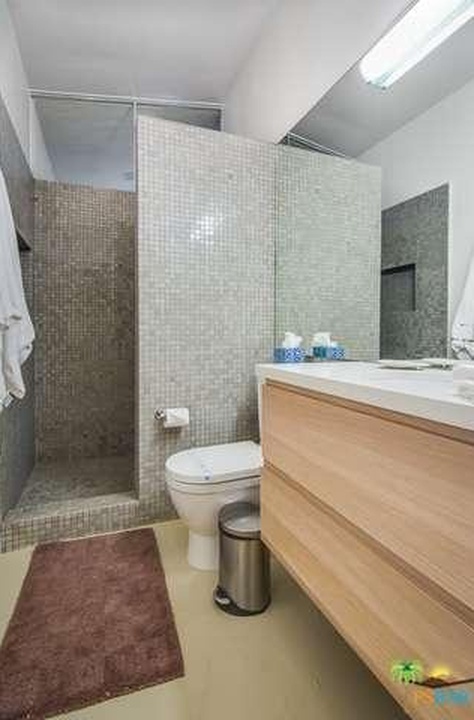 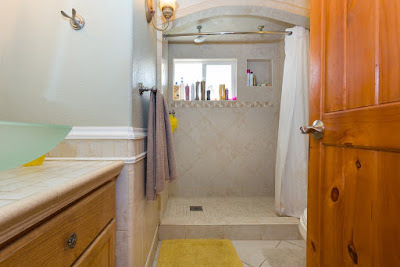 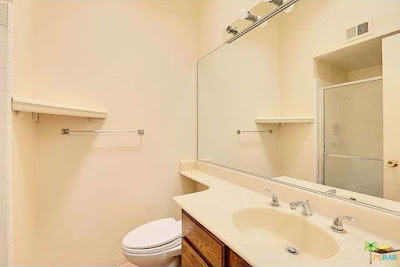 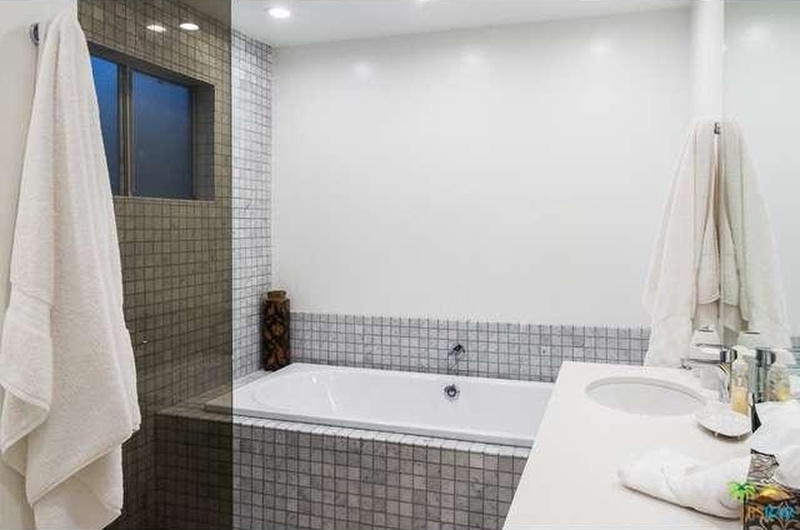 All the bathrooms have been updated, with floating vanities, clean mosaic tilework and new fixtures. The backyard is centered around the original 15’ x 30’ Alexander swimming pool, with lots of covered and uncovered patio space surrounding it. 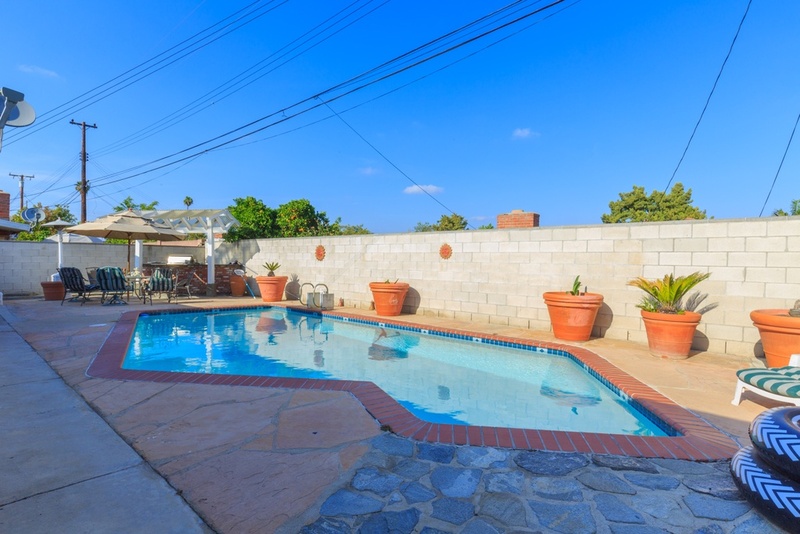 Tall green privacy hedges surround the pool, and distant views of Mt. San Jacinto to the west are provided over the roof of the home. 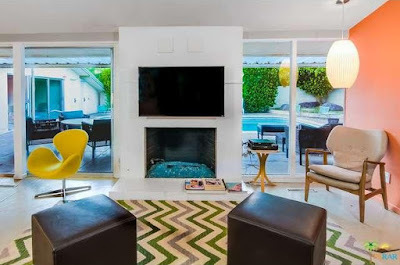 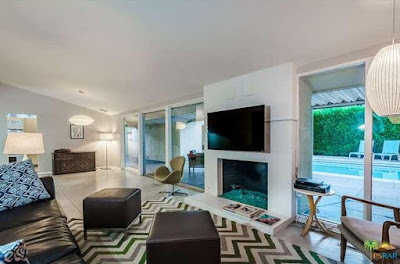 This is a great opportunity for anyone looking to acquire a Palmer & Krisel vacation home, especially those looking to flex a little creativity in bringing a property to the next level of modernism. 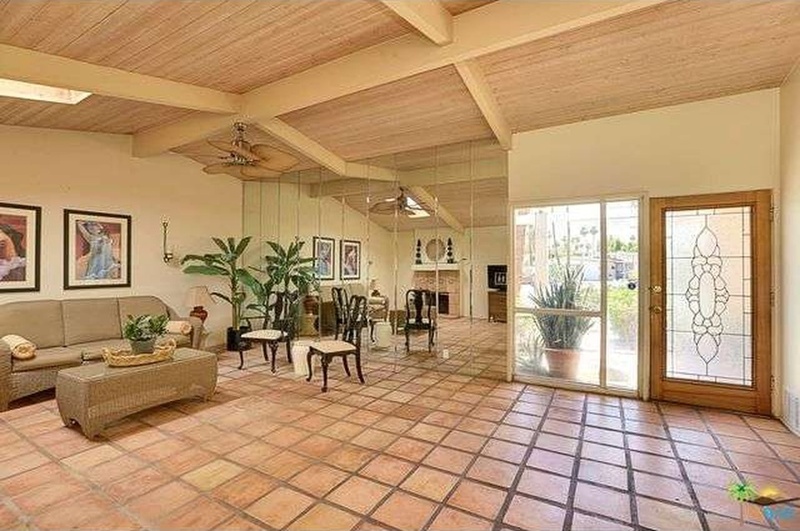 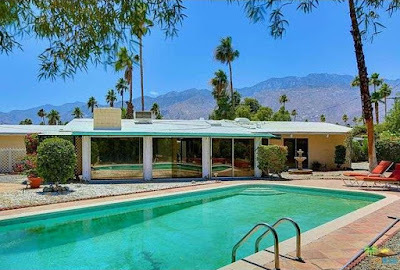 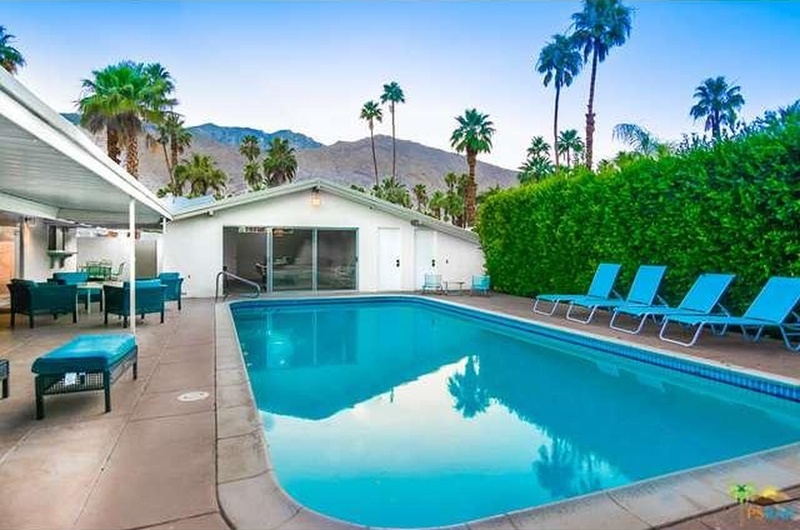 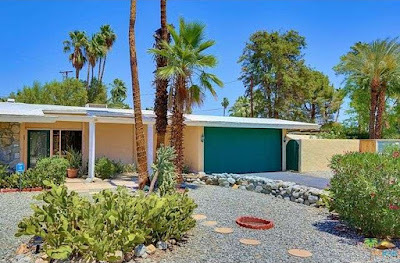 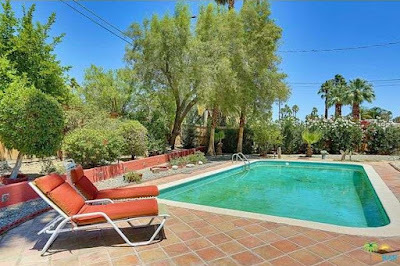 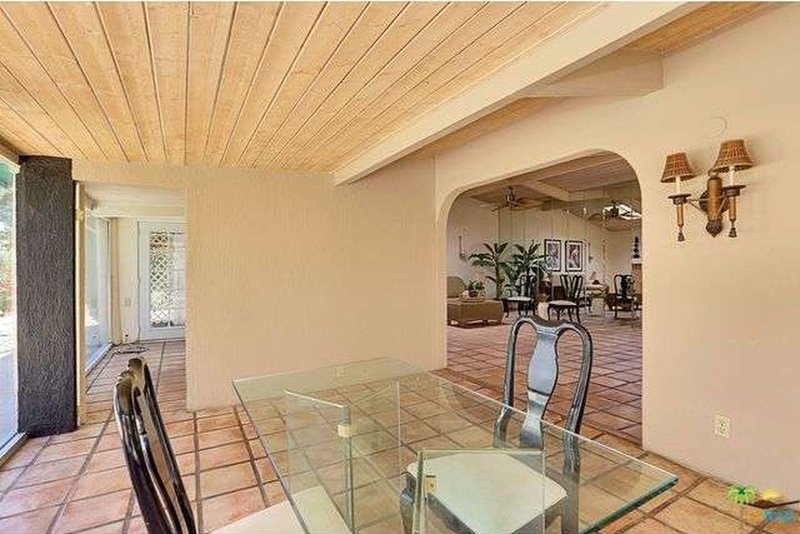 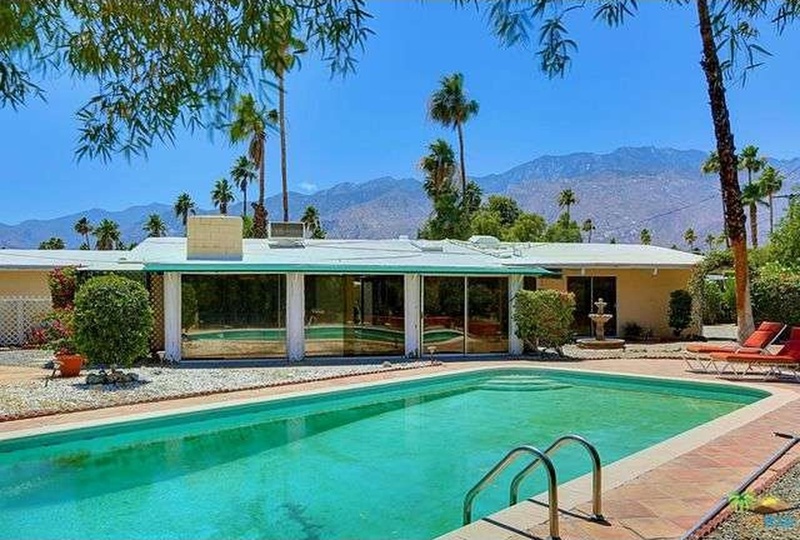 Built in 1958 by the Alexander Construction Company is this mid-mod Palmer & Krisel fixer opportunity in Sunmor Estates in Palm Springs, CA. 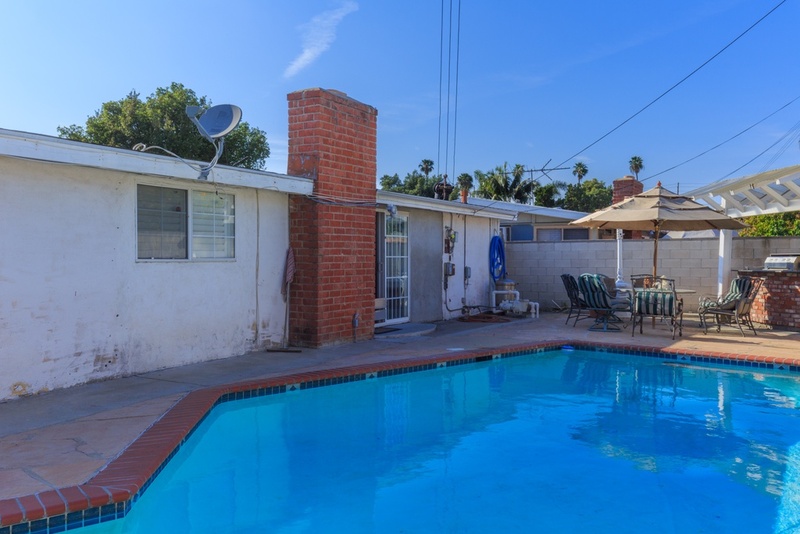 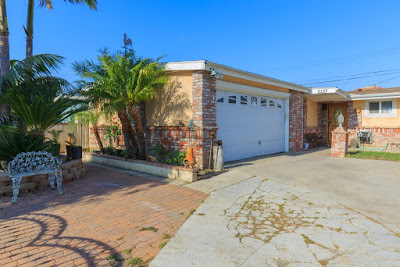 Situated on a 12,100 square-foot cul-de-sac lot, this home includes three bedrooms and two bathrooms in 1,278 square feet, a private backyard with an in-ground pool and carries an asking price of $489,500. 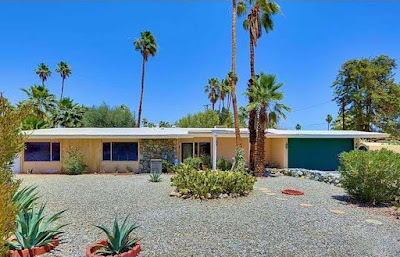 Located on a Jill Circle, a street named after the Robert and Helene Alexander’s daughter, is this wonderful diamond in the rough. 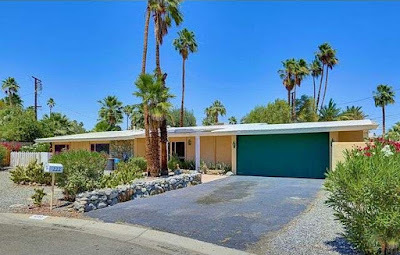 Quietly facing south, the home features an older desert front yard, asphalt driveway and a carport converted to a two-car garage. 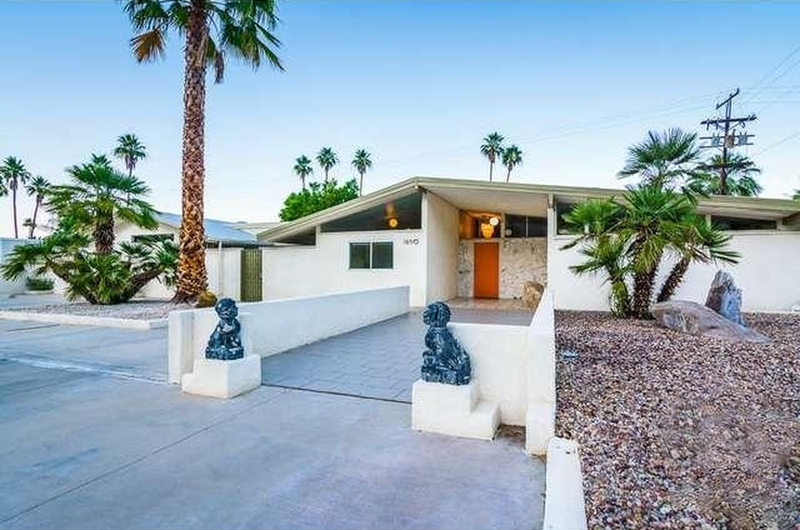 Original decorative stone accents sit next to the front entry, and deep roof overhangs welcome guests to this desert retreat. 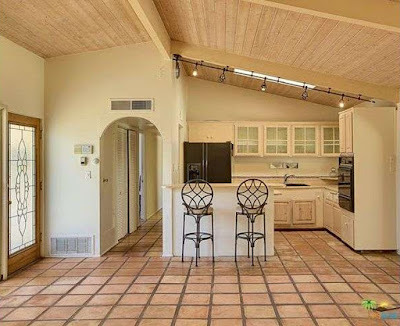 Inside, the home has seen a heavy southwestern motif applied to it, with lots of light Saltillo tile covering the floors and rear-facing fireplace, along with a mirrored wall next to the leaded glass entry door. 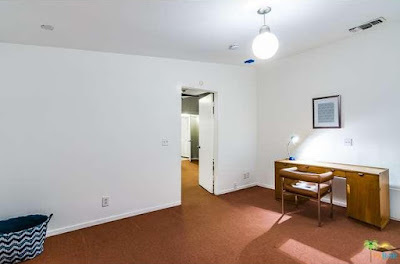 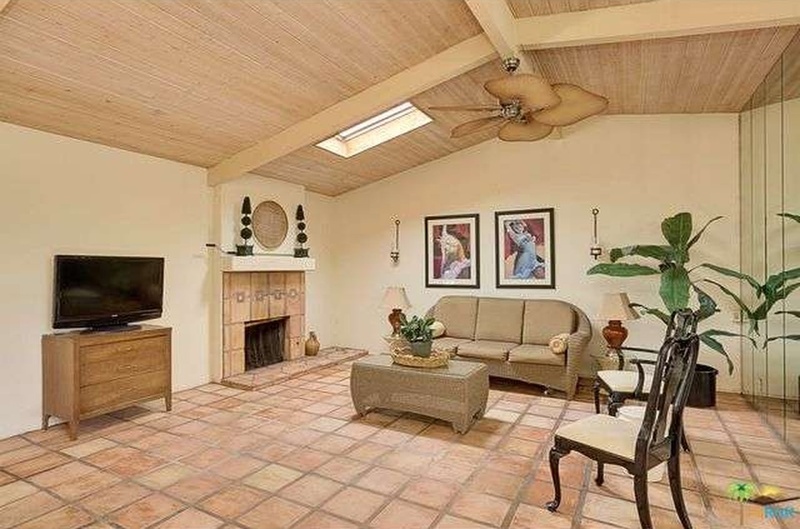 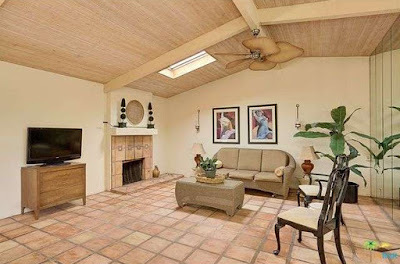 The original open-beamed vaulted ceilings are still in place, and a skylight has been added to the living room. 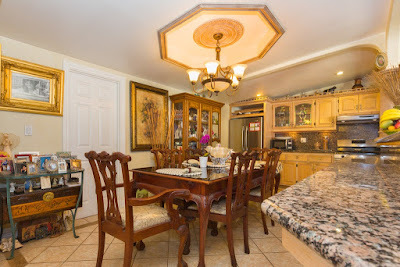 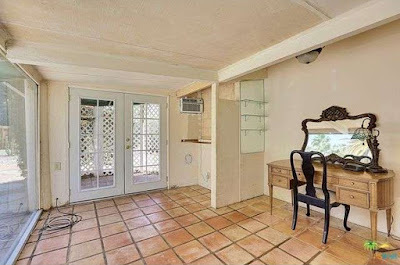 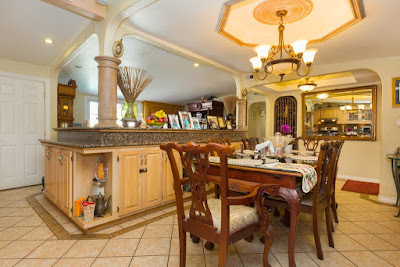 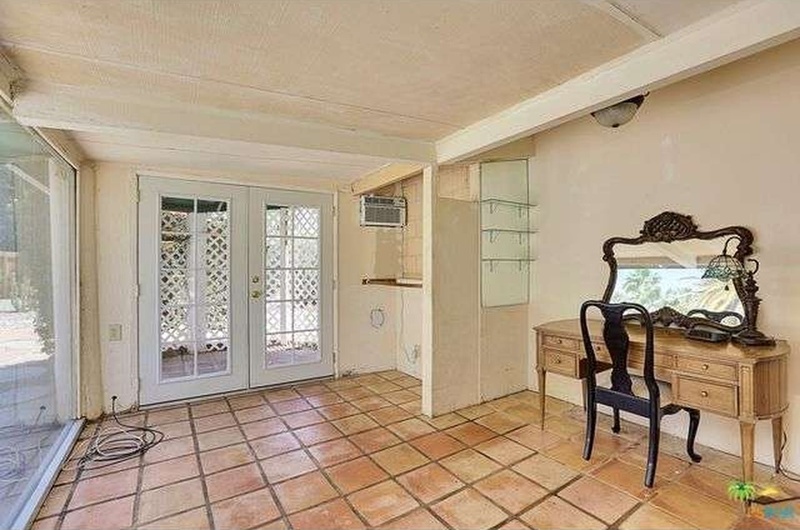 The original dining area sits adjacent to the living room and opens to the adjacent kitchen; however a rear sunroom addition has been tacked onto the home which is currently used as the dining area. Judging by the listed square footage of the home, the rear addition isn’t taken into account, which most likely means there aren’t any permits for the room. The addition eliminates the original living room floor to ceiling windows, along with the original dining room sliding glass door and kitchen window, cutting down on the amount of natural light entering the space. 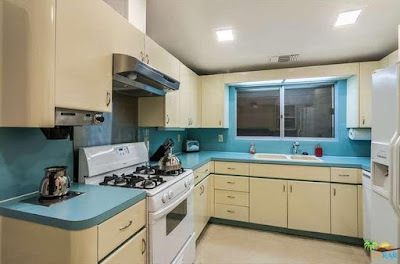 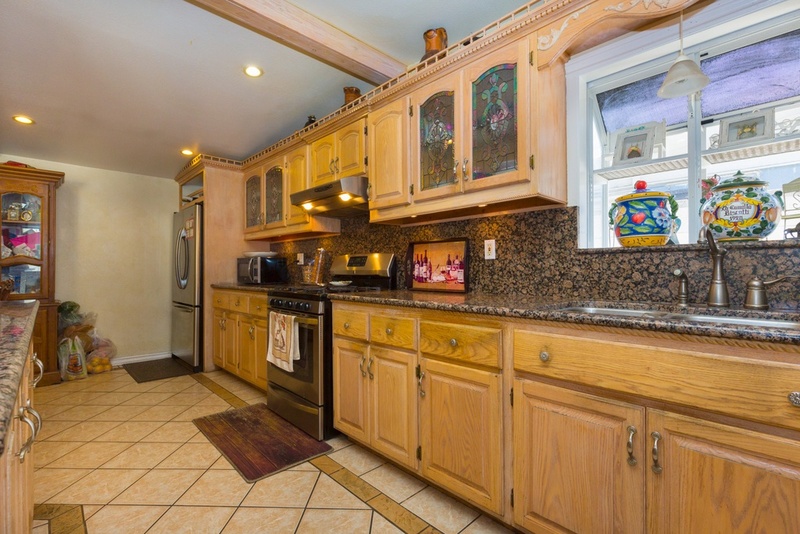 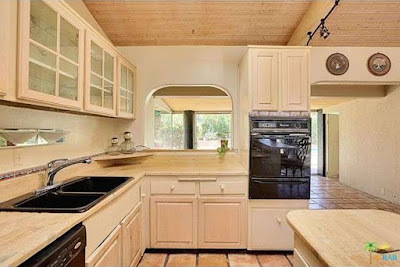 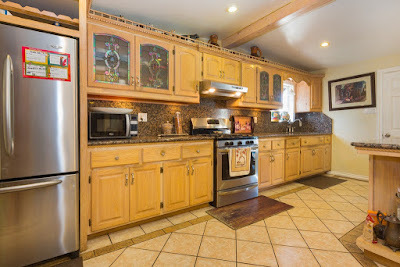 The kitchen has been updated over the years; however the cabinet boxes appear to potentially be original, while the door faces date from the later part of the 20th century. 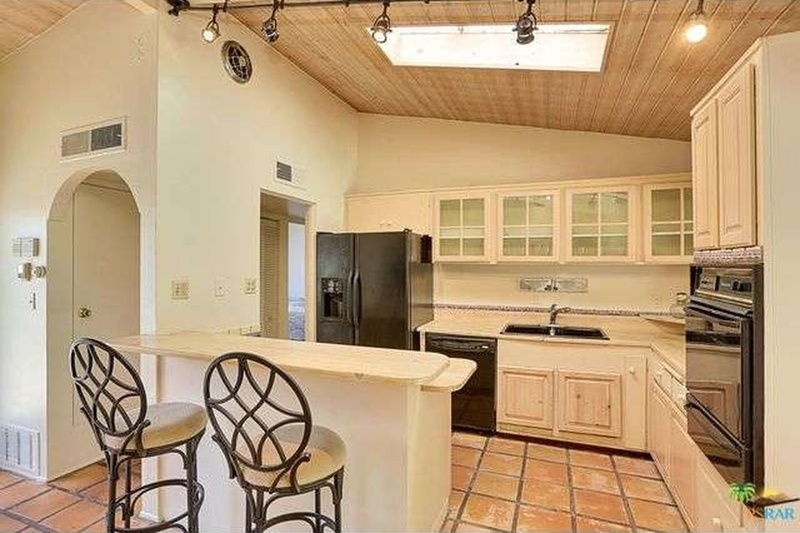 The appliances have all been updated over the years, and a skylight helps to add daylighting to the kitchen workspace. 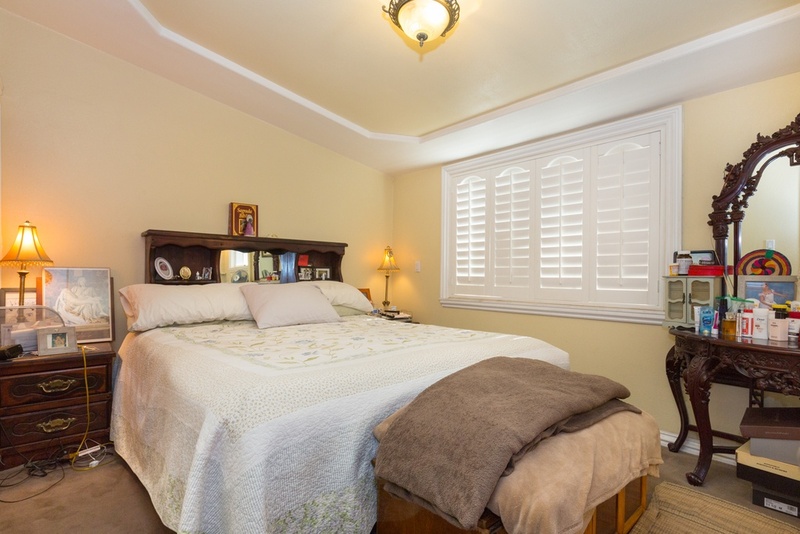 The three bedrooms are all in their original configurations, with the secondary bedrooms at the front of the home and the master at the rear. 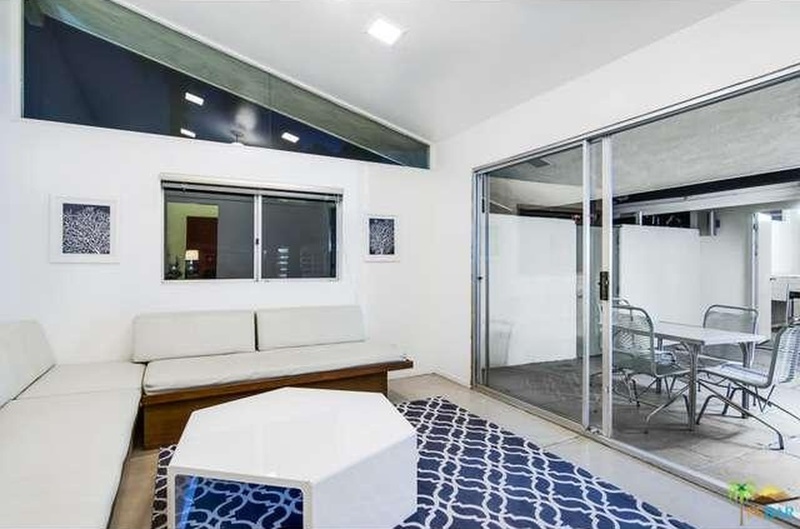 All three bedrooms feature open beamed vaulted ceilings, while the master includes a sliding glass door to the backyard. 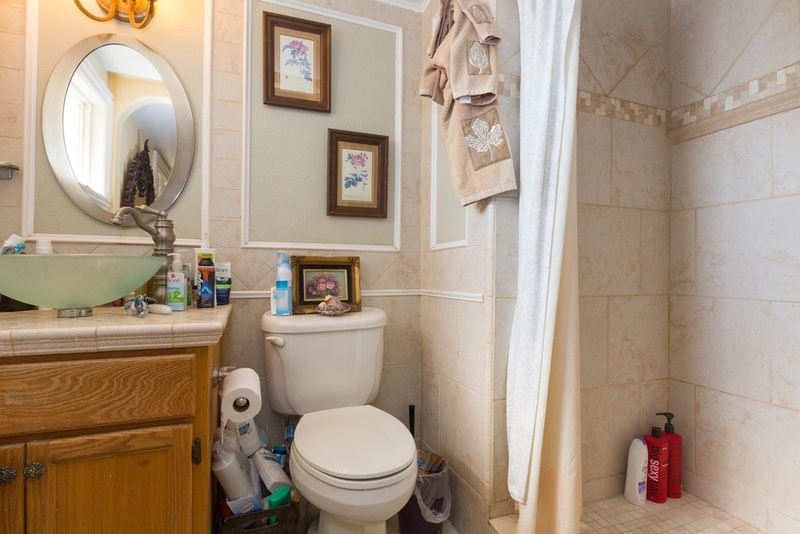 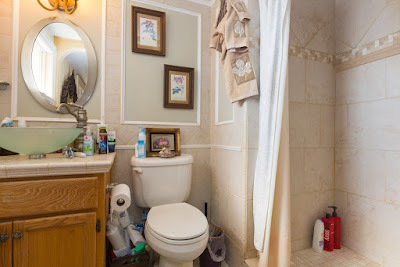 Both bathrooms appear to have early 1980s updates, and the guest bath contains its original 1958 pink tub and tile surround. The northeast-facing backyard is an excellent landscape opportunity, with its large 15’ x 30’ Alexander swimming pool at the center of the yard space. 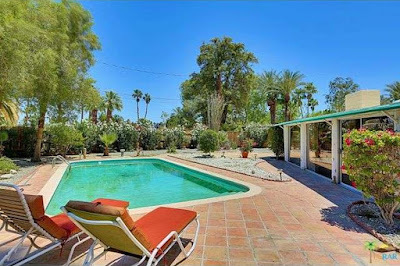 Saltillo tile covers the pool decking and adjacent patio, and an assortment of shrubs, trees, palms and other desert plantings make up the yard. 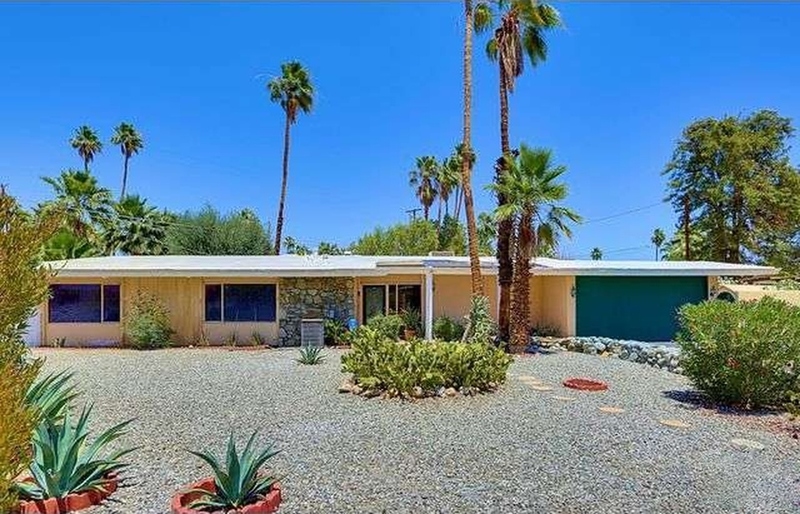 While the current southwestern theme of the home is a far cry from its midcentury modern roots, there’s great potential on this property to create a dream modernist showplace.